The card game 99 is played with three or more players and is enjoyed by both children and adults. The rules of the game are very simple and it is quick to learn. It is a great learning activity for children as it introduces them to adding and subtracting. Adults quickly realize that winning requires well thought-out strategies. The object of the game is to be the last player to make a play. Remove the jokers from the deck of cards. Shuffle the cards and have each player draw a card to determine the first dealer. This can be the player who drew the highest of lowest card. Each player starts with three tokens or pennies. Start by having the dealer reshuffle the deck and deal out three cards to each player. 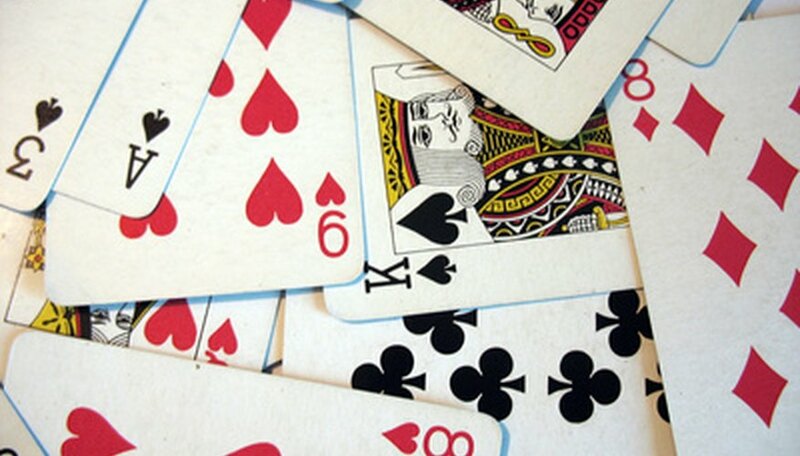 The remaining cards are stacked face down on the table within reach of all players. This is the stock pile. Each round starts at zero points. The player sitting to the left of the dealer starts the round and play continues clockwise. Assign the following values or actions to the playing cards. All other cards add their face value to the total. For example, a seven of hearts adds seven points. Start play with the first player; she lays down one of her cards face up next to the stock pile and states the total. For example, she lays down a six and states that the total is six. After she plays she immediately draws a card from the stock pile. If she forgets to draw a card before the next player plays, she must play the rest of the round with only two cards. The next player lays down a card and states the new total. If she lays down a three, she announces the new total to be nine and draws a card from the stock pile. Continue playing until one player is not able to lay down a card without causing the total to go over 99 points. If a player is unable to play, the round ends and she loses one of her tokens. The cards are reshuffled by the next dealer and the next round begins. Eliminate players when they have lost all three of their tokens. The winner of the game is the player who makes a valid play and still has tokens left. Use two decks of cards when playing with more than eight players. Instead of tokens or pennies, points can be awarded to players who lose a round. A player can then be eliminated when she has accumulated a set number of points.